The European Citizens’ Initiative STOP TTIP has been dismissed by the European Commission. Its organisers now want to take the decision to the European courts. Announced in July, the European citizens’ initiative STOP TTIP was officially supposed to begin at the end of September, but it will come to nothing: the Commission has blocked the project, planned by ATTAC in Germany, and supported by the Greens. The European citizens’ initiative (ECI) provides a platform for citizens to present a legislative proposal to the Commission, if they collect over a million signatures. The ECI on the Transatlantic Trade and Investment Partnership (TTIP) was greatly anticipated, although the negotiations on trade agreements with Canada and the USA are in full swing. “Of course the Commission did not take this decision alone. But the rejection of this initiative is above all a political decision,” asserts Yannick Jadot, a Green MEP. He is amazed by the lack of political vision shown by the European executive on the subject. “The ECI gives the citizens a voice, allows them to express their fears. We should not limit this space, which is already so narrow”, he argues. The initiative’s organisers are recalling the example of an ECI on the free movement agreement between Switzerland and the EU, known as “Swissout”, which was accepted in 2013. Although the project was withdrawn by its organisers, its acceptance by the European Commission created a precedent for ECIs concerning international agreements. “The European Parliament has evolved, and the subject of TTIP has become sufficiently important for the Commission to give it serious attention. This decision demonstrates that the Commission is afraid that European citizens will take control of these issues, illustrated by the contempt they have shown for the 170,000 comments on the subject, already collected during public consultation,” Yannick Jadot adds. The MEP believes that the ECI needs reformulating, but that it remains an indispensable vehicle of expression for citizens. “The Commission is only listening to lobbyists, rather than the citizens,” STOP TTIP representative Michael Efler commented. But he is not prepared to leave the matter there. “Now, the battle is really starting,” he says. Efler plans to challenge the European Commission’s decision in the European courts. Negotiations between the US and the EU on the Transatlantic Trade and Investment Partnership (TTIP) began in July 2013. Since the formation of a new, more Eurosceptic Parliament, opposition to the free-market agreement has become more intense. If the treaty is signed, it will affect almost 40% of world GDP. The transatlantic market is already the most important in the world, accounting for €2 billion of goods and services per year. If successful, the deal could save companies millions of euro and create thousands of new jobs on both sides of the Atlantic. The average European household could save €545 per year and European GDP could increase by nearly 0.5%. Brussels and Washington want to conclude the ambitious negotiations and seal the deal by the end of 2014. Legal opinion regarding the admissibility of a European Citizens' Initiative against TTIP? EURACTIV Turkey: TTIP kar??t? giri?im Avrupa Komisyonu engeline tak?ld? No surprise there is the citizens initiative which only needs one unelected political no hoper to say no and it won’t go through this has been the outcome of every million vote initiative to date but i bet if there was one to give the failed politicians a raise it would be accepted. Time to get out of the corruption ridden democratically deficient eussr now. 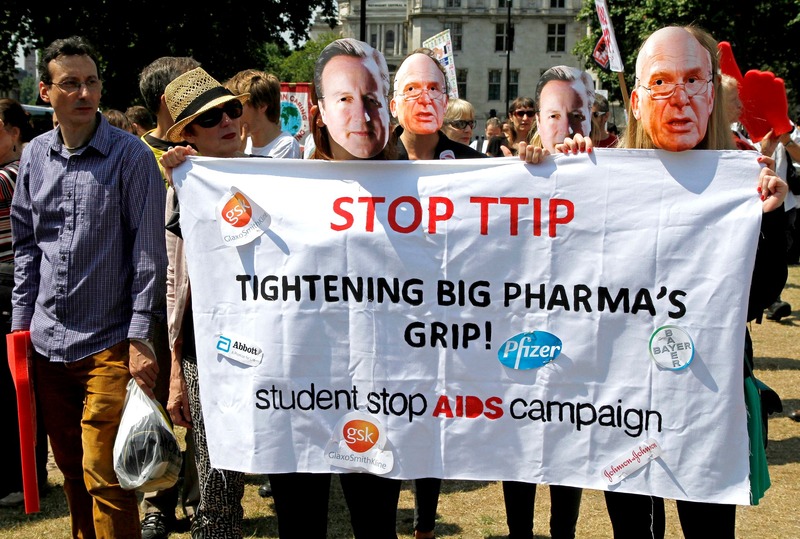 Isn’t the UK the biggest pusher of the TTIP? At least there are things such as the European Citizens Initiatives, although they’re generally going to be the kind of thing that “activists” try to use to push juvenile ideas. But, I didn’t realise Barry was such a supporter of the Green Party! But Barry – your mates the Kippers support TTIP – & it is a simple matter of fact that TTIP will open up, for example, the NHS to more (no less) privatisation. You appear to be in favour of a vote on the UK leaving the EU, but appear to be against other democratic initiatives. Funny that – I guess for you democracy is a bit like the curates egg?